Well, I am loving everything British this week. What’s more traditional than a proper cup of tea? Good thing I have an insider in the fam who keeps me hooked up. There are several brands the locals (as in across-the-Atlantic locals) use – my fave is PG Tips, which comes in little pyramid-shaped bags. And guess what? I can buy it at my local grocery store. It’s not the thriftiest, but since my Brit brother Rich keeps me stocked, I haven’t had to patronize Cub. First, you need to boil your water properly. What, you ask? Isn’t this elementary? No. It’s not. You must start with cold water. I have a teakettle (I checked at Macy’s and you can get pricey ones! but mine is from Target), but I also have an electric kettle that works for me. 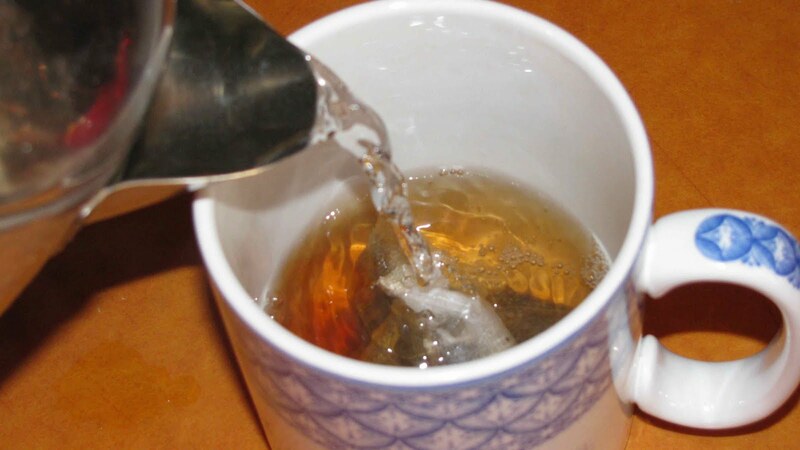 The second key to boiling water for tea is to not allow it to come to a full rolling boil. This just takes a practiced ear. When I can hear it getting close, I pull the plug and the water’s perfect. You want the water piping hot, but not too hot or you’ll scald the tea leaves. Next you place the teabag into your cup. I have no tips for doing this correctly. You’re gonna have to go with your gut. Pour the water into the cup, about 4/5ths of the way to the top. I leave a little room at the top to allow for milk, which I prefer with my tea. According to Rich, it’s especially proper to steep the water and teabag in a teapot. I have a lovely red one from Whit and it’s FAB. But since I usually only make a cup of tea for myself (Shaun’s definitely a coffee guy), I forego this propriety. NOTE: if you use a teapot, you may need to use extra teabags so it’s strong enough. Also, when I make tea from loose tea leaves (a la Teavana), my red teapot has a built-in strainer. One of the trickiest steps is getting the tea steeped just long enough to be strong, but not too long or it becomes bitter and gets cold. I know what the proper look of the tea is when it’s steeped perfectly and, for me, it looks like black coffee; it’s not black, but a dark chocolate brown. If I’m not standing over the tea watching it steep (which is never), I use my cheater method, which is to set the clock for 5 minutes. When it buzzes, it’s done and I take that tea bag out! You can dress your tea however you’d like. 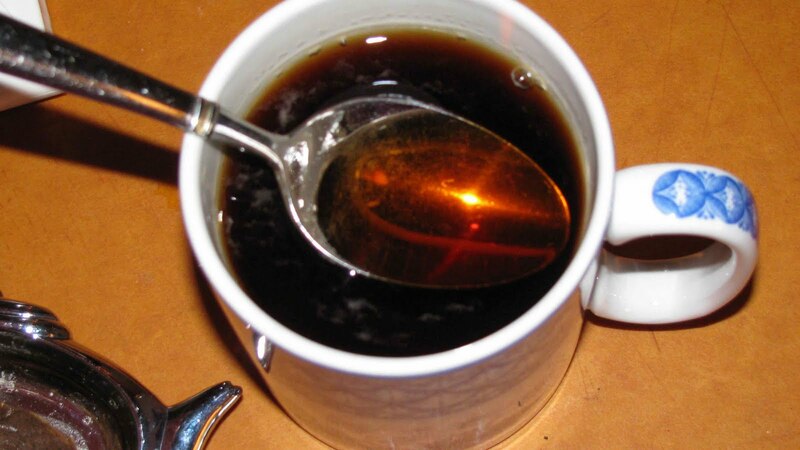 For my PG Tips, I like either 1 teaspoon of regular sugar or 1 Splenda tablet. Is Splenda proper you ask? Why yes – I have my pack of Splenda tabs from Rich’s friend and London resident, JS. Rich says that if you’re really posh, you use a lump or cube of sugar. One lump, or two? I’m a one-lumper. These tabs are from London! I am not certain how much milk I add. Probably between 1 and 2 tablespoons. 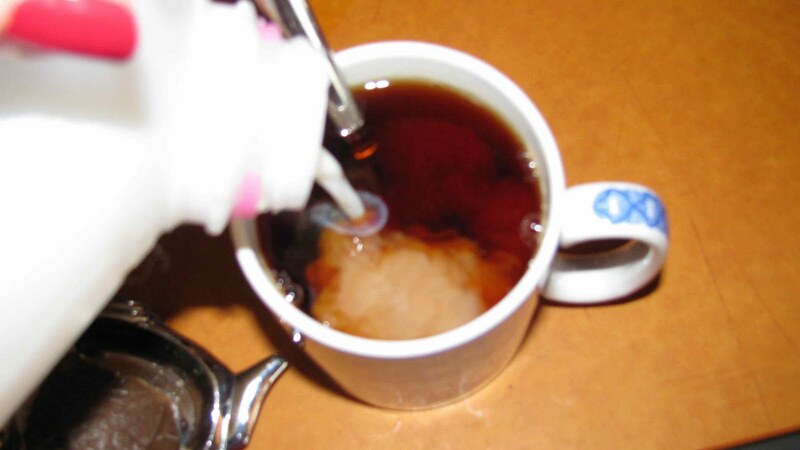 I basically know it’s right when, as I pour, the milk flushes back up to the top of the tea like a cloud. Don’t forget – it’s proper to use milk, not cream. I use 1% because that’s what we buy. I have a couple other tea favorites. Earl Grey tea – with honey instead of sugar. And I take it up another notch with Teavana’s Earl Grey Crème – pretty much the best tea on Earth. Lipton’s black tea is great and costs a couple bucks for a lot of bags – that’s your thrifty bet. If I'm looking for caffeine-free herbal tea, I like chamomile, Teavana's Peach Tranquility/Honeybush Vanilla or their Swiss Vervaine Melange/Honeybush Vanilla. With options like these, who needs smelly old coffee? Actually, it's the smell of coffee I like. It tastes horrible. When I’m up at 3 am to start my wedding-watching, you can bet I’ll be sipping some tea – straight from across the sea – and staring down my lovely sapphire and diamond ring from Shaun (yes, my real one) and the other from Wills. I’ll almost be there. Almost.